Most Sunday mornings, regardless if I’ve had Clara overnight on the Saturday, I try and make it to her swim class to watch her. Taylor and Joanna are usually there as well, and the three of us sit together, catching up if we haven’t seen each other in a few days, usually waving simultaneously if Clara looks up to see if we’re watching. At the beginning, when we’d be together in public spaces – the pool at the gym, Wonderland, or her school functions – I used to be self-conscious, and hyper-sensitive. Were people watching us? Were they trying to understand our dynamic? Was it foreign to them, as friendly co-parenting seems to be, especially with a new partner and step-mother added to the mix? What stories were they making up at a distance? I was a bit obsessed – in my mind, I saw us as a non-Mormon Canadian version of Big Love – when the truth likely was that nobody was actually watching us at all. For a while, I cared too much about these potential stories that I was perhaps giving them more weight than they actually deserved. (I’ve spent a lot of my life doing that; caring what others think).Then I realized I needed to own my perceptions – and quite frankly, my own judgements. And as soon as I started to do that, I started to feel a shift. The biggest thing for me was at birthday parties and play dates that Clara was invited too and some of the other moms started to ask questions, hesitantly it seemed at first, about the custody schedule for Clara, my relationship with Taylor as Clara’s dad and an ex-spouse, and with Joanna, as Clara’s step-parent. Initially feeling shy, I forced myself to start meeting the eyes of the person asking me questions, and began taking some time answering. Before, I’d say everything was fine and brush it off casually, to avoid getting into it further; if I even allowed myself to let that conversation open up. I’ve gotten pretty good at filling conversation with other people by asking them questions about themselves to deflect and self-protect. Instead, I started to let the gaps in conversations happen organically, and when I left an opening – people started to fill them with questions of their own. And I learned pretty quickly that the people asking questions weren’t judging – most seemed genuinely curious. They seemed to be asking questions because they wanted to understand. And it seemed like they wanted to understand because it was something that they hadn’t seen before. A friend of mine commented recently that while she might not understand my co-parenting relationship(s), it was whatever worked. It’s certainly not the first time I’ve heard something like that and likely not that last. Sometimes, if I’m on autopilot or not feeling resourced enough to provide more detail, I say the default, automatic canned response – that it’s what’s best for Clara because, yes, ultimately this is true. That’s the easy answer. Because absolutely it’s what’s best for Clara – but it’s also what’s best for me and allowing me to move forward in my own life – and in my relationship with her dad. I think the latter is likely what’s more difficult for people to understand. Because they seem to understand putting Clara’s best interests first; but the idea of two parents divorcing and putting their differences behind them, forgiving and moving past the petty grievances, and investing in their relationship with one another – that’s a concept that seems harder for them to fathom. At the pool this morning, while talking with Taylor, another mom joined us. Clara has befriended her children, and we’re all becoming friendly as a result. I don’t remember exactly was she said, but at one point, it seemed like she forgot that we weren’t together as a couple and asked a question that seemed to allude to that. And her pause could have been a bunch of different things – awkwardness, or confusion or a thoughtful contemplation, I’ll likely never know, because I didn’t ask. Instead, I smiled (kindly or gently, I hoped) and the conversation moved on. It’s little things like those silences – where I’m not quite brave enough to ask what they mean or maybe it’s because I no longer care what they mean (my preference would be the latter) – it’s those silences that I’m letting go of and moving past. Because while they matter – I feel there’s recognition or validation in those silences – they’re not as important to me as the questions that I find eventually following. I’m starting to love those questions and how they challenge perceptions and judgements, my own included. Clara finished her swim lesson. And because it was a beautiful day and I had some time available to me (a broken washing machine is a great reason not to do laundry and watch Netflix on a Sunday), I decided that I’d join Clara, Taylor and Joanna at the outdoor pool for the afternoon, with Clara’s grandfather. We set up lounge chairs and ordered lunch poolside, and all took turns going in the water to swim with Clara. And yes, maybe we went mostly unnoticed (or I’m not simply noticing as much) or yes, maybe the couple sitting across from us on their lounge chairs, languidly applying their sun screen, watched us from behind their sunglasses. But for perhaps the first time, I didn’t catch myself imagining what their stories were – instead, I watched Clara, and imagined what her stories would be when she grew up. 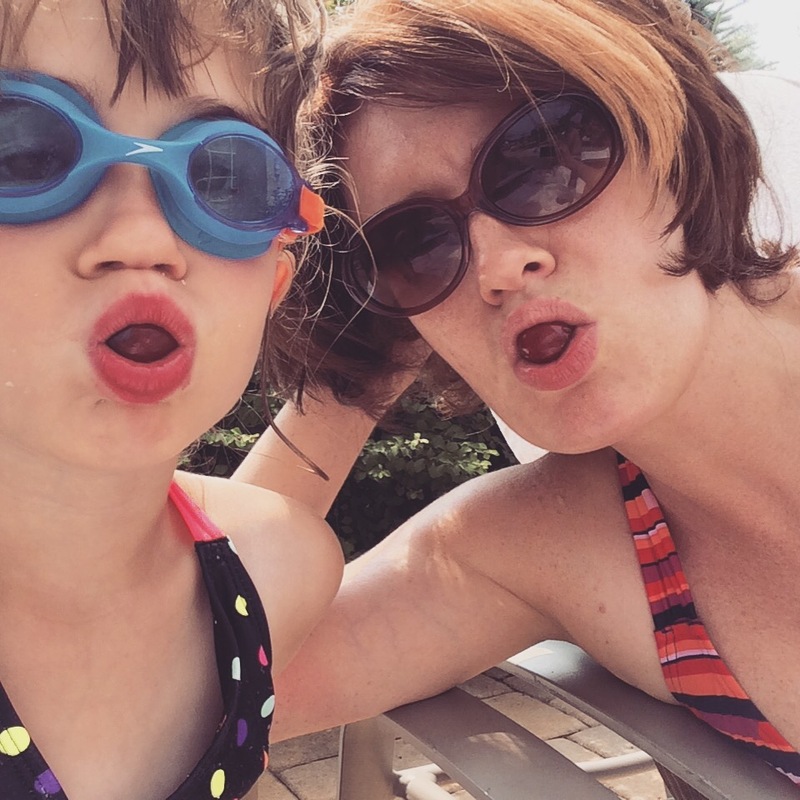 How she would remember us on this summer day, as she practiced her swimming and ate cherries beneath an umbrella in the sunshine. At the end of the afternoon, I left them at the pool so I could go inside to a yoga class. I hugged Clara, she pressed a kiss to my mouth. “See you Wednesday, Mama,” she said in a natural voice, as if it were perfectly natural. It’s nice to see you back! (Funny thing, I promised Aunt Nita I would start again after almost a year.) I liked your honesty in this because as your sister I can’t help but wonder myself sometimes how this is all affecting you. Even though I understand it’s all for Clara, you matter too 🙂 Oh and I love your hair.